Few people ask this question, and the people who do tend to expect the answer to be somewhere around once a decade. The real answer is that, well, it depends. As window washers, we would love to see our clients trained to the same six to eight week schedule that is common in England. However, that just seems a little optimistic. Local weather conditions: In the San Francisco Bay Area, where rain is the exception not the rule, dust accumulation is more common than water spots. And, when the rain does come, that dust turns to mud. Surroundings: If you are in an urban center, your windows are likely to pick up more pollutants; on the other hand, rural areas tend to have more pollen build up. (Both are allergens that can have a bearing on your physical health.) Windows protected from the elements by overhangs, vegetation, or just by the nature of their location can go longer between cleanings than those next to high traffic areas. Proximity to Ocean: If you have a great view of the Pacific or the Bay, then the sea air – and all the salt it contains – has a great view of your windows. As a corrosive, you want to wash that salt accumulation away regularly. Screens: Window screens, by definition, make windows look dirty. And screens hold onto dirt better than glass. Image: People who frequently entertain will want to have their windows done more often so that their home always sparkles for visitors. Personal Curiosity: If you wonder if your windows are clean, they probably aren’t. For the most part, a home can generally get away with a thorough cleaning twice a year. For windows that look great all year round, two to four professional washing a year is optimal. If you want to clean your inside windows once a year and your outside 2-3 times a year, this is an option that should keep your windows looking good all year round. You can also save on cost and have key windows cleaned periodically without doing all your windows each time. Consider this: clean windows have a direct link to emotional health. Studies prove that sunlight improves mood. Smudged or dirty windows reduce the amount of sunlight that enters a home, causing a more depressing environment for the inhabitants. 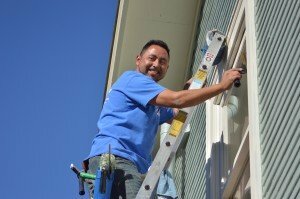 No matter how often you have your windows done, make sure to hire insured professionals to receive the best service available.